Description: This was taken at my wife's parents' wedding - well over 40 years ago. Last week we had our first child and having these memories so accessible to share with Emily means a lot. We have already run all the scans through Picasa's face recognition software and Melissa's parents are in the process of geo-tagging and captioning each of the pictures to ensure everything is given context and easily searchable. [caption and photo provided courtesy of Bruce Cameron]. Check out this Kodak TV commercial from the 1960s and follow the progression from baby to adult, not as modern high-tech as today's Google Super Bowl ad, but a wonderful memory and reminder to share and save all your pictures, especially those cherished photos tucked away in albums. Keep in mind that these timeless Kodak TV commercial memories are light-years behind the new high-tech modern Eastman Kodak Company as it transitioned from film to digital and beyond. ScanMyPhotos.com named #16 "Photo 100 Best in Photography"
Quick take: You send them a box of photos, and the pros at ScanMyPhotos scan them, all for as low as 4 cents an image. Let the scanning begin. Perhaps that should be the motto of ScanMyPhotos, a spot that’s all about turning your boxes, bins and envelopes of print images—whether they’re from your bar mitzvah in the ’70s, your great-grandma’s wedding in 1902, or maybe even from your recent past—into digital form. ScanMyPhotos is known for speedy, reliable service, and for providing detailed instructions about how to send your photos and get them safely back. Though plans vary, one option costs $64.00 for 1,000 scans, with your images converted into digital form and placed on a DVD. Add-on services are available, too, such as image rotation, photo books, and photo enhancements. But the key here is getting those images scanned, and then having them available for sharing and printing and whatever else. "WEB100.com is your source for the best of the web. At Web100.com, rankings and reviews guide you to the web’s best sites and resources. Our top 100 lists, top 10 lists, and other lists help you cut through the web’s clutter and find the information you want. We choose websites and online resources based on their quality, popularity, usefulness and other factors. Advertisers and sponsors have no role in determining the content of Web100.com’s top 100 lists and other editorial features. At Web100.com, we value our editorial independence." 6 Aviary Unzip your cat’s skin, make a frog out of metal: just two things you can do with this fun photo editor. 12 Rock You Rock the social network with great-looking photos: RockYou provides applications for making the most of MySpace, Facebook, Friendster, Bebo, and more. 17Digital Camera HQ It’s like a dating service for you and cameras: Learn all you need to know before you commit. 18 iStockphoto.com Stock up at iStockphoto, the online spot to buy and sell stock photos. Free to join, easy to use. 19 Photodoto hotography is for everyone at Photodoto: Learn the basics of photography, hone your skills, or browse reader photos. The only thing inexpensive and amiable about a marital split is who gets to keep the memories pictured on photographs. The in-laws, "out-laws" and everyone in the family can now easily get copies and archived digital DVDs from all their photos. ScanMyPhotos.com operates a worldwide photo scanning service to instantly scan all photographs. 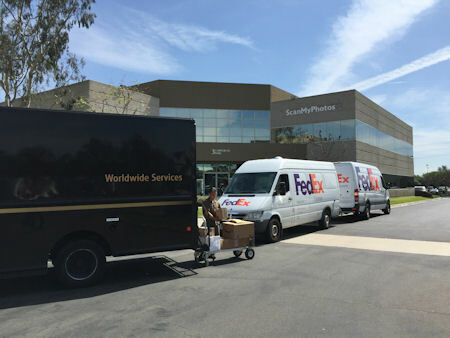 The company has scanned tens-of-millions of pictures so far and operates an ecommerce and a retail photo center since 1990, based in southern California. Pay just $64.00 to instantly have up to 1,000 professionally scanned photos preserved on high resolution (300 dpi, 1.0-1.5 MB) digital files. Reprints and duplicate photo enlargements printed on real 100% Kodak-quality photographic paper is just as fast. While you wait. Although this service is available to everyone with shoeboxes of generations of family photos, it is especially useful for people undergoing the daunting challenges of divorce where nothing seems easy, or inexpensive. To prepare your photos for scanning, please visit ScanMyPhotos.com for complete ordering instructions. Over the past 20-years, ScanMyPhotos.com [30 Minute Photos Etc.] has handled all types of photographic work assignments. Often the most challenging are from divorced couples who want to each get copies of their once treasured memories. The pursuit of copying so many photos once was prohibitively expensive and emotionally straining. But, thanks to a new high-speed commercial scanner and software from the Eastman Kodak Company, super-fast, high quality scans are easy to produce. It is as simple as having the attorneys mail in the photos to ScanMyPhotos.com and have it back the next business day. Why people digitize their analog photos is not always a pretty picture. According to a revised study released today by ScanMyPhotos.com, lamentable events in people's lives top the list of ten leading reasons why people are choosing to have high-speed commercial scans made from their shoeboxes of pictures. But, collectively, pleasurable family occasions are also an important reason for preserving photographs." After and earlier poll of customers, we just asked again, and the results have maintained and mirror those prior ranking. The poll was motivated by wondering why people digitally archive their generations of family pictures that were previously stored in shoeboxes," explained Mitch Goldstone, president and CEO ScanMyPhotos.com. According to ScanMyPhotos.com, topping the list of ten primary reasons why people want to scan pictures was divorce. "It turns out that the most common reason for scanning pictures is due to divorce and seeking to easily split up photos," explained Goldstone,. His company, ScanMyPhotos.com instantly marry pictures to a digital CD before a divorce takes it away. And, according to Goldstone, "the only thing easy and inexpensive about divorce is deciding who gets the photos; for just $64.00, his company commercially scans up to 1,000 pictures in minutes or buy a prepaid box that holds about 2,000 standard pictures for $149.95 [buy two get third free]." Divorce, followed by funerals and anxieties over fading photos topped the list, according Goldstone, who is a well-known photo imaging industry leader and regular speaker at major photo industry conventions, including PMA, Lyra Research, CES and InfoTrends. This time, four hundred and twenty people were interviewed earlier thsi year for this revised study which identified the top ten reasons people scan pictures. [Methodology. According to 420 consumers who were polled by ScanMyPhotos.com during Jan 5-18, the top reason why they chose to have their entire shoeboxes of pictures commercially scanned was impending divorce]. photo scanning, slide scanning, how to scan photos all about photo scanning, Donny Deutsch “The Big Idea”, family photos, fast photo scanning, how to scan photos, MSNBC, photo scanning, photos to DVD, Walt Mossberg. It took me close to two years to finally get that box your company sent over for me to fill up with photos and when I received the scanned results, I was amazed. The quality of the scans was excellent. My All-in-one printer with the built in scanner couldn’t have done a better job. I now have the peace of mind that all my photos have been digitized and I can now put my photos away and share the scanned versions with family and friends. You guys have a great and affordable service and I can’t thank you enough for helping me with this task.